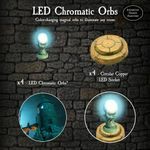 The LED Chromatic Orbs Pack is part of the Castle Builder System. It is made of "Dwarvenite" and includes some metal parts. Some parts have LED circuitry (switch, battery, and socket) to support LED lighting attachments. Some parts lighted by an LED. This item was initially available as an add-on to a pledge level during the Castle Builder System Kickstarter. It was not advertised during the Kickstarter campaign but was made available during the final order. The item comes in both painted and unpainted versions.